woman given just days to live after being told she has terminal cancer has shared her heartbreaking final photos in a hospice. Amy Redhead, 28, battled severe abdominal pain before her sudden bowel cancer diagnosis last October. The aggressive disease had already spread to 70 per cent of her liver and Amy was told her cancer was terminal. After being offered chemotherapy to prolong her life, she refused and instead decided to enjoy her final months without feeling unwell. Her devastated family has shared photos of her in a hospice to show others the devastating impact bowel cancer has on the body. Amy has put up a brave fight over the last few months, but has told her family she is “ready to die now and no longer be in pain”. aggressive disease had already spread to 70 per cent of her liver and Amy was told her cancer was terminal. now and no longer be in pain”. Amy was initially given six months to live but in the past week her health has rapidly deteriorated and she now just has days. But selfless Amy has already planned her own funeral and has created a memory box to ease the pain for her family when she’s gone. 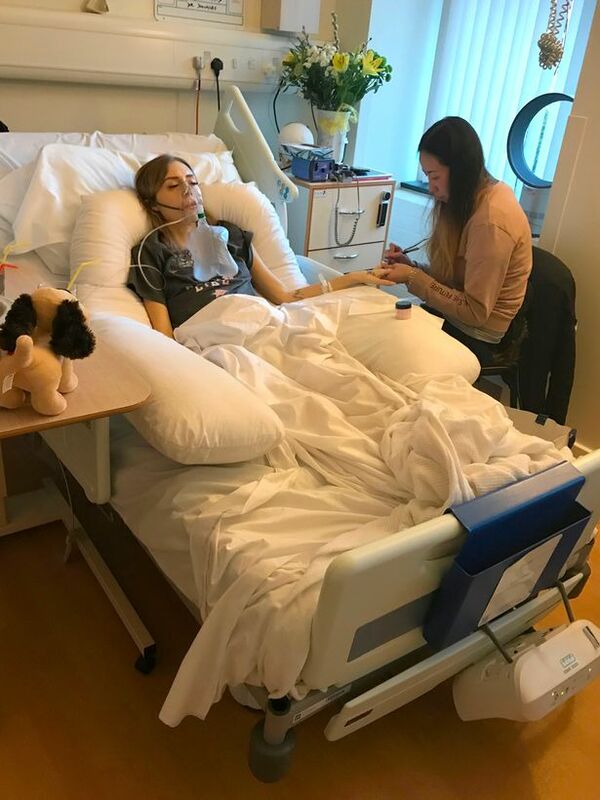 Her younger sister, Emily, 22, from Bromsgrove, Worcestershire, is now sharing her story to help raise awareness for bowel cancer. Emily said: “Amy had suffered with abdominal pain before her diagnosis but because of her age, she was dismissed by doctors. “She’d lost loads of weight but it wasn’t until she felt a lump in her stomach that she was referred for tests. “We were all devastated when we were told it was bowel cancer and that it was incurable. “Amy is so stubborn and it was no surprise when she refused chemotherapy, the doctors had already told us it would only give us more time. Emily said the family is grateful to have recently celebrated Amy’s birthday, Christmas and New Year, and their dad Robert’s 76th birthday together. She is now giving updates on Amy’s condition to her supporters. Amy was using social media to tell her story, and her last Facebook post on January 31 shows her getting her nails done. Just two days earlier she revealed that she was being moved into the hospice at the Princess of Wales Hospital in Bromsgrove. She gave the heartbreaking news that her condition had “deteriorated dramatically over the past 48 hours”. Emily said: “Amy has shared her story on social media throughout her ordeal but now she’s not well enough to do so for herself anymore, we’re doing it for her. “We’re sharing the photos of her in the hospice from the past few days to show others the physical impact bowel cancer has on the body. “Amy has lost four stone since her diagnosis and now looks nothing like her happy bubbly self. Amy was diagnosed with colitis – inflammation of the inner lining of the intestine – from the age of 11 and was warned that she was at a higher risk of developing bowel cancer. Emily said: “Amy was fit and enjoying the gym just weeks before she was diagnosed. We don’t know whether she first blamed her symptoms on her colitis but we want people to be aware of any changes if you have the condition. “It’s important that those with the illness keep on top of their regular checks. “If something feels different or you have an unusual pain then get it checked as it could have saved Amy’s life. Bowel cancer is one of the most common types of cancer diagnosed in the UK, although most people with it are over the age of 60, the NHS says. The symptoms can be subtle and don’t necessarily make a person feel ill. It is not known what exactly causes bowel cancer, but age, diet, weight, exercise, alcohol and smoking, and family history are among the risk factors. Some people are at a higher risk because they have another condition such as extensive ulcerative colitis or Crohn’s disease. “We hope Amy’s story highlights the link between ulcerative colitis and cancer. “Amy decided to stop all of her medication last week and is now preparing for the end of her life. “She is on a high dose of morphine for the pain and with 70 per cent of her liver now being consumed with cancer, blood clots in her lungs and around her heart, we could lose her at any time. Amy has created a memory box for her sister, Emily, and has already cut some of her hair as a keepsake as well as giving her her rings. Emily said: “I asked Amy to create a memory box for me to look back on, we’ve always been so close but even more so since her diagnosis. “Our parents, Lynn, 63, and Robert, have always told us not to argue when we’d have silly rows as we’d only have each other once they were gone. “Amy’s diagnosis has made me realise how important siblings are and to never take the little things for granted. After she was diagnosed Amy launched a fundraising effort to help her family pay for her funeral if her “holistic fight” wasn’t successful. She told how she was diagnosed with terminal cancer and chose not to undergo chemotherapy, opting for an “alkaline/vegan diet” with lots of organic fruit and vegetables. She wrote on a GoFundMe page: “I have always been a firm believer in natural healing, and this situation was no exception. If chemotherapy couldn’t cure it, then I was going to tackle it my own way, avoiding harsh, conventional methods for as long as possible. “I have chosen to us an alkaline/vegan diet which will include lots of organic fruit and veg. There are lots of other things I am currently researching such as intravenous Vitamin C also.”I’m not asking for much, I appreciate any contributions. I’ve never been one for asking for help – but I feel this would ease a massive amount of stress for my family at this difficult time.